There is a crisis-level shortage of math and science teachers. As more current teachers retire and fewer new teachers enter the profession, the nation faces a decreasing supply of high quality teachers. This is especially true in STEM fields and high-needs schools, where 40% or more of students qualify for free or reduced lunch. According to the US Department of Education, there has been a documented shortage of math and science teachers in California every year since 2010. In recognition of this crisis, California’s colleges and universities have created initiatives to address the teacher shortage: the Math and Science Teacher Initiative (CSU), and CalTeach (UC). Despite these efforts, enrollment in teacher credentialing programs in California colleges and universities dropped by more than 40% since 2007, and more than 50% since 2001. Working in parallel with CSU’s and UC’s efforts to recruit college students to the teaching profession, EnCorps is dedicated to recruiting mid-career STEM professionals to become math, science, engineering and technology teachers. The demand for high quality math and science teachers continues to go unmet; it is currently estimated that about 3,000 new math and science teachers are needed in California alone every year. Across the United States, 25,000 new teachers are needed each year, but fewer than 9,000 high school graduates who would be “highly qualified” said that they would be interested in teaching (opportunityculture.org, 2014). Students are unprepared to compete in a global economy. 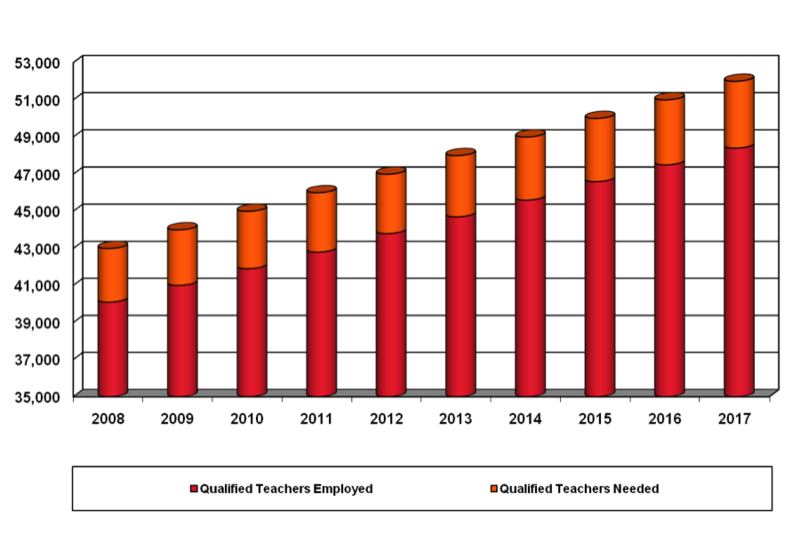 In California in 2012, 50% of high school students achieved proficient scores on the state standardized tests in math. 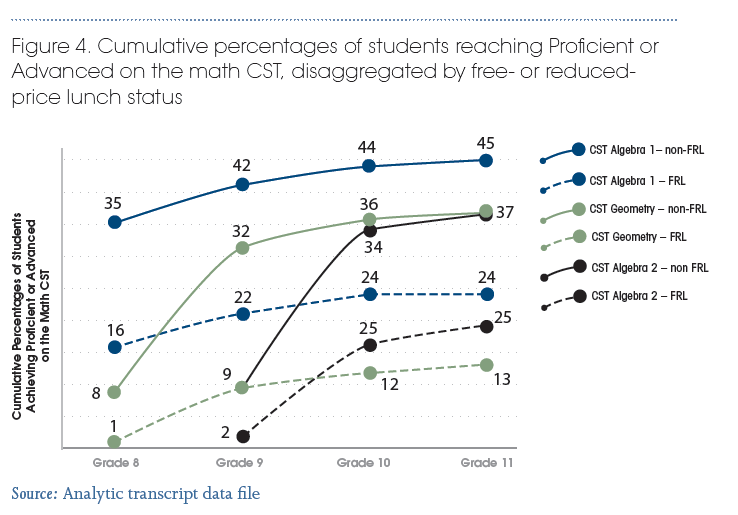 This statistic is even more alarming when disaggregated by income: under 25% of California low-income high school students scored proficient in math. Fewer college students major in STEM fields. Interest in entering a STEM field has waned in recent years. Now, fewer than 1 in 6 college students in California are majoring in STEM fields, ranking California the 45th state in the nation producing students with STEM degrees. 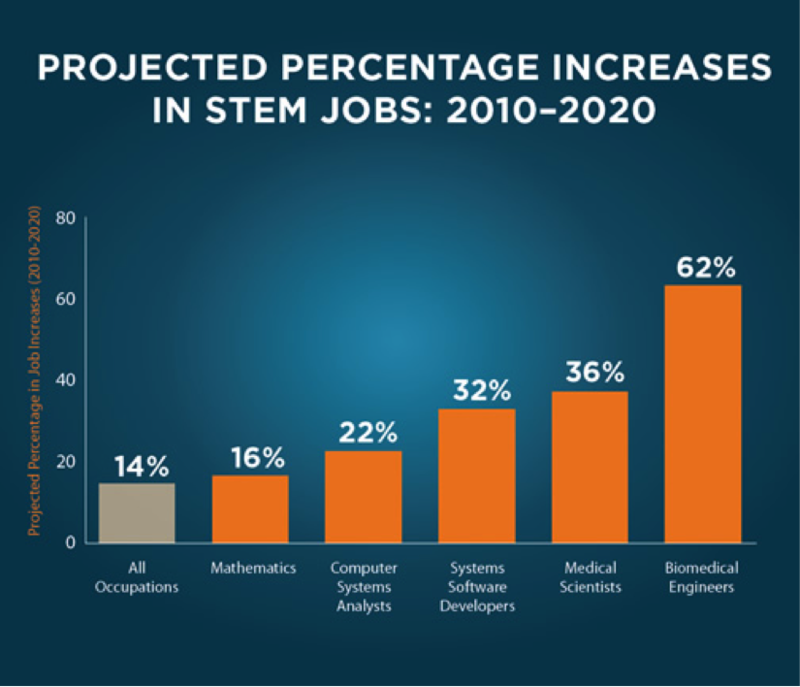 This is despite the fact that demand for STEM jobs is increasing. There are 1.5 million unfilled jobs in STEM fields, or 1.4 STEM jobs per each qualified candidate (compared to 1 job for every 4.9 unemployed people).